There are two distinct sources for this name, one of English origin and one of Scottish. 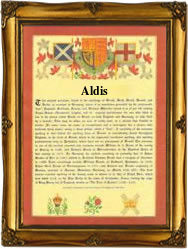 The English form of the name derives from the Middle English female personal name "Aldus", itself a pet form of any of the numerous Old English pre 7th personal names for male and female with (e) ald, meaning old, as the first elememt, e.g., "Goody Aldis", 1674, Hearth Tax Records of Suffolk. The surname, Aldous, is found widespread in the eastern counties of England and is first recorded in the early half of the 14th Century - Peter Aldous - The Subsidy Rolls of Suffolk, dated 1327. The second derivation is locational from Auldhous in Strathclyde (Renfrewshire). The recording from this source is earlier, (see below). In the "modern" idiom the name is spelt Aldhous(e), Ald(h)ous, Aldus, Aldis(s) and Alldis(s). The marriage of John Alldis and Eleanor Cornwill was recorded at St. Pancras, Old Church, London, on August 5th 1792. The first recorded spelling of the family name is shown to be that of Roger (son of Reginald de Aldhous), which was dated 1265, He resigned all claim to the lands of Aldous, Renfrewshire, during the reign of King Alexander 111 of Scotland, 1249 - 1286. Surnames became necessary when governments introduced personal taxation. In England this was known as Poll Tax. Throughout the centuries, surnames in every country have continued to "develop" often leading to astonishing variants of the original spelling.